Jenny Slate hits the red carpet at the premiere of The Sunlit Night held during the 2019 Sundance Film Festival on Saturday night (January 26) at the Eccles Center Theatre in Park City, Utah. The 36-year-old actress kept things cool in a black coat over a white blouse and black jeans as she was joined at the premiere by co-stars Zach Galifianakis and Alex Sharp along with author of The Sunlit Night Rebecca Dinerstein. Earlier in the day, the stars stopped by to chat with Kevin Smith at the IMDb Studio about the film before Jenny made an appearance at the Pizza Hut Lounge. FYI: Jenny is wearing a rag & bone coat, Bella Fraud blouse while carrying a Mulberry bag to the Pizza Hut Lounge. 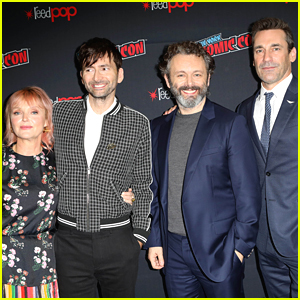 Jon Hamm & David Tennant Debut 'Good Omens' Trailer at NY Comic-Con 2018 - Watch Now! Jon Hamm and David Tennant join co-stars Miranda Richardson and Michael Sheen as they arrive at the 2018 New York Comic-Con on Saturday afternoon (October 6) at the Javits Center in New York City. The stars stopped by the event to promote their upcoming Amazon Video miniseries Good Omens – and debuted the first trailer of the show! The six-episode series will follow demon Crowley (David) and the angel Aziraphale (Michael) seek to prevent the coming of the antichrist, ending in a final battle between Heave and Hell. Good Omens will premiere on Amazon Video in early 2019. Caitriona Balfe & Sam Heughan Premiere New 'Outlander' Opening Credits at NY Comic-Con 2018! The cast of Outlander are dishing on season four at 2018 New York Comic-Con! Cast mates Caitriona Balfe, Sam Heughan, Sophie Skelton, Richard Rankin stopped by the event on Saturday afternoon (October 6) at the Javits Center in New York City. The cast stopped by the IMDb press event hosted by Kevin Smith where they revealed the show’s new opening title sequence. Season four of Outlander returns to Starz on November 4. You can check out the new season four credits on Variety.com. FYI: Sam is wearing an Alternative Apparel t-shirt. Kevin Smith Shows Off 51 Pound Weight Loss - See the Pic! Kevin Smith is shedding weight per his doctor’s orders! After nearly dying from a heart attack earlier in 2018, the 48-year-old actor, director and comedian showed off his progress on Instagram on Sunday (August 26). “This @weightwatchers Ambassador is thrilled to announce that I’VE LOST 51 POUNDS!” he captioned his post. 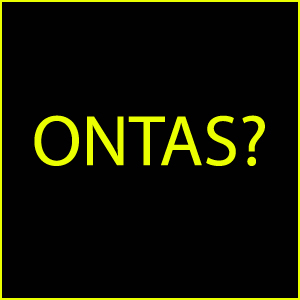 Check out his update post below! Hailee Steinfeld & John Cena Bring 'Bumblebee' to Comic-Con! Hailee Steinfeld and John Cena are repping their new action-adventure movie Bumblebee at 2018 Comic-Con! 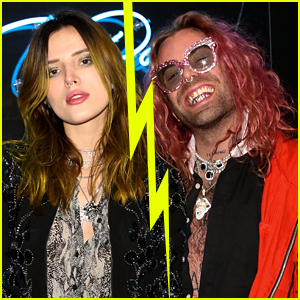 The 21-year-old Pitch Perfect star – who stunned in two gorgeous looks – and the 41-year-old professional wrestler teamed up for the event held on Friday (July 20) in San Diego, Calif. 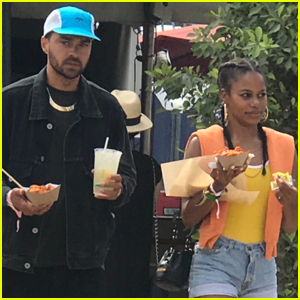 They were joined by their co-star Jorge Lendeborg Jr. and director Travis Knight. Rotten Tomatoes, the popular movie and TV review aggregator, hosted the group at the Rotten Tomatoes space. Additionally, John, Jorge, and Travis checked out the #IMDboat with host Kevin Smith as well as SiriusXM’s Entertainment Weekly Radio Broadcasts at the Hard Rock Hotel. Also in attendance at the various spaces were Halloween‘s Jamie Lee Curtis and director David Gordon Green. Don’t miss Bumblebee when it hits theaters on December 21, and Halloween on October 19! FYI: Hailee is wearing Prada in the gold look with APM Monaco rings, and Tom Ford in the red look. Jorge is wearing a Levi’s® trucker jacket. Kevin Smith stepped out to support his daughter Harley Quinn at the premiere of her new movie All These Small Moments! The 47-year-old actor showed off his 32 pound weight loss while hitting the red carpet during the 2018 Tribeca Film Festival on Tuesday (April 24) at SVA Theatre in New York City. Kevin decided to shed the weight after suffering a massive heart attack back in February. He was accompanied at the event by his wife Jennifer Schwalbach Smith as well as the cast of the film including Molly Ringwald and Jemima Kirke. All These Small Moments follows a teenage boy and infatuation with a woman he sees on the bus, which further complicates his already tumultuous adolescence. FYI: Harley is wearing Nha Khanh and Alex Woo jewelry.